DentaKit Braces Survival Kit is the leading premium orthodontic travel kit for adults, teens and kids in dental braces. This handy dental kit contains everything you need to keep your teeth sparkling clean between meals, including a leak-proof pop-up folding cup to help rinse your brackets clean! It's all inside a 4-by-6 inch durable denier nylon case — the same tough material suitcases are made from! We are also pleased to announce that our product was recently awarded the "Braces Friendly Seal of Approval" by Metal Mouth Media Inc.
DentaKit Braces Survival Kit weighs only 6 ounces, and all the contents are held snug and secure until you need them. Created by an adult orthodontic patient, DentaKit Braces Survival Kit is a top quality product that will help you to protect your orthodontic investment. Each component has been carefully chosen and tested for its quality, functionality, and durability. Thousands of people around the world have treated themselves to the ease and convenience of this product. How about you? Show you care by giving this handy kit to a friend or loved one in braces -- they'll appreciate that you thought of them! 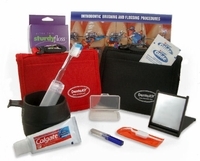 At holiday time, DentaKit Braces Survival Kit makes a great "stocking stuffer," too! Available in black, red, and new blue!